It’s not a stretch to say that curcumin, the active ingredient in turmeric, has superpowers. The compound is an antioxidant and anti-inflammatory, and helps stimulate sleep-supporting hormones. 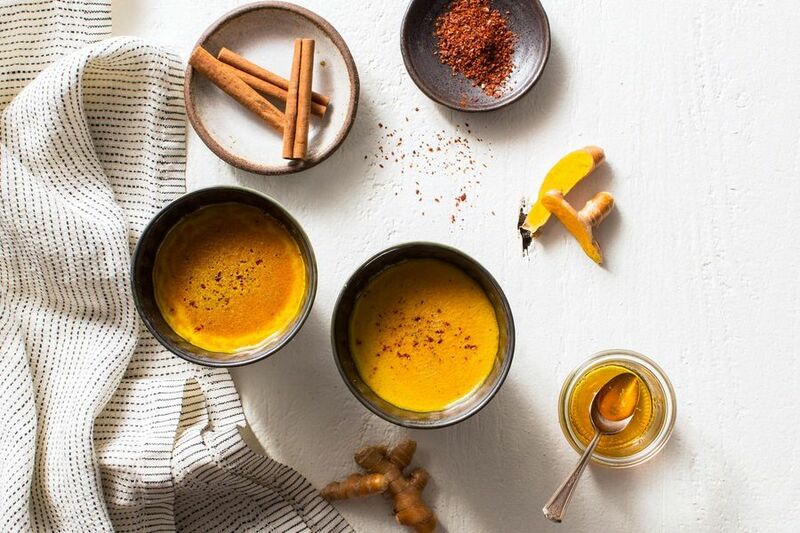 Here we add fresh (or ground) turmeric, with an array of warming spices and honey to almond milk, for a hot soothing caffeine-free nightcap. Like all nutrients, curcumin doesn’t work in a vacuum; both black pepper and ghee help activate it, making it more bioavailable so you enjoy the benefits more fully. In a medium sauce pot over medium heat, combine the ghee, turmeric, ginger, black pepper, and cinnamon and cook, whisking constantly, until the ghee is melted and the spices are blended, 1 to 2 minutes. Whisk in the honey and cook until fragrant, about 1 minute. Whisk in the almond milk, bring to a boil, reduce to a simmer, and cook, whisking occasionally, until the flavors have developed and the milk is piping hot, 4 to 5 minutes. Remove from the heat. Strain into individual cups and garnish with as much Aleppo chile as you like. Tip: Refrigerate any leftover latte to reheat or serve chilled over ice. Nutrition per serving: Calories: 100, Protein: 2g (4% DV), Fiber: 1g (4% DV), Total Fat: 7g (11% DV), Monounsaturated Fat: 2g, Polyunsaturated Fat: 0.5g, Saturated Fat: 2.5g (13% DV), Cholesterol: 10mg (3% DV), Sodium: 190mg (8% DV), Carbohydrates: 8g (3% DV), Total Sugars: 4g, Added Sugars (honey): 4g (8% DV). Not a significant source of trans fat.